New DISC GOLF course ! Disc-Golf is a growing game that makes use of the player's ability to observe, think and adapt. It's open to all ages, amateur or professional, for leisure or competition. This sport is played with « Discs » (frisbees), while still following the essential rules of golf. The « HOLE »consists of a start, or « Tee », and a target called "basket". The object of the game is to complete the entire course with the minimum number of throws. The « PAR », indicated on the scorecard, represents the numbers of throws needed to put the disc on the basket. Any extra throws are counted as a penalty point. Each player makes their first throw from the tee and continues from where the Disc finishes. It is always the player whose Disc is furthest from the basket that plays first. The rules do not require that you do not touch anything in the environment, but rather to avoid the obstacles such as branches, bushes, and trees. 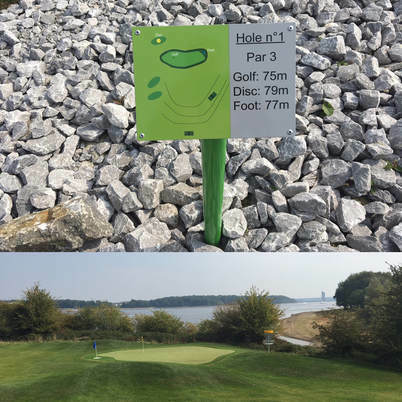 The rules also require that you stay within the authorised area specific to each hole. Throwing your Frisbee out of bounds results in a 1point penalty on your score. The player will continue from where his/her ball went out of bounds. A "Mandatory" is a required drop passage which will cost you 1 penalty point. To resume play, find the "drop zone" at the height of the mark. The winner is the person with the fewest shots overall.